In 2009 on the July 17 weekend the Toronto Dingos made the trip to Mohawk Park in Hamilton on a hot summer day with swirling humid winds to take on the Wildcats. 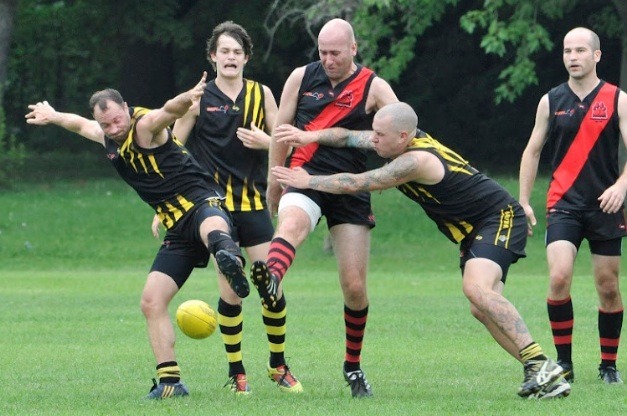 The Dingos had lost four in a row prior to the round eight encounter and needed to win to stay in touch with finals. Of note, the black and red lost their earlier match against the Wildcats in round one, on a wet dreary day, and knew this clash was going to be tough: both teams were vying for the sixth final’s spot. It was a low scoring affair with the Dingos managing to hold on to a valuable 18-pt win over the ‘Cats kicking 7.13 (55) to 5.7 (37). Had the Wildcats kicked even straighter the wayward Dingos could have found themselves with a loss and no chance of playing finals in 2009. It was ugly footy for most of the game, but, it was a valuable win. Craig Stewart kicked two goals and Canadian Ben Oryall was named best on ground for his tagging role in the midfield. Andrew Gaut was also in the best.